Stansted Airport is one of the 6 London international airports, occupying the third place in what regards the traffic. It is a busy airport, with thousands of passengers landing and departing every day. This means that there are numerous individuals in need of London Stansted Shuttles to and from London. If you are travelling in a bigger group and want to get to Stansted Airport or have to go to the Capital from the airport, you have the possibility to choose from three options: the train, the bus or a private hire company’s minicab. Let’s see what do they offer and which one is the best. The train is easy to take as the rail station is located right below the Terminal. These trains will take you to the Midlands, in eastern England and in east or central London and you can purchase the tickets from the station or you can book them in advance so as to be sure that there will be enough seats for your group. In order to get to London, for example, you must take the Stansted Express that will leave at London Liverpool Street or at Tottenham Hale. The service departs every 15 minutes and the journey lasts around 50 minutes. The price for a single – way journey would be £23.40. The train also stop at Harlow Town and Bishop’s Stortford. From Tottenham Hale and Liverpool Street, you can take the Underground Service that will take you further. The coach and bus station at Stansted overlooks the terminal entrance. You can purchase the tickets on board, at the station or from the arrivals, at the ticket desk. Unfortunately, you cannot book your tickets in advance, so you cannot be sure that the coach or bus you need to get to your destination will have enough seats for your groups of people. There are coaches that will take you to London and special coaches that can take you to the test of the country. The companies that offer Stansted Shuttle services are: National Express, easyBus and Terravision. They all stop in Central London. The journey takes between 40 and 85 minutes and the minimum fare is almost £9 per person. The final option would be a minibus service offered by a minicab company. 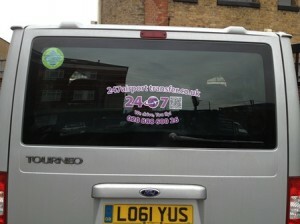 This type of London Stansted Shuttle is without any doubt the best option if you’re travelling with bigger groups. To begin with, it is much more comfortable and cleaner than the train and the bus. Then, it offers you the time convenience. Basically, you won’t have to wait in the station for the train or the bus, as the minibus will already be there for you when you get to the arrivals. Moreover, the minibus can stop anywhere you want, unlike the other 2 means of transportation that can only stop in specific stations. So, you won’t have any hassle with the luggage. Finally, a minibus service is most of the times cheaper than the train or the bus. For instance, 247 Airport Transfer provides Stansted Shuttles to Central London that cost around £88 per car, £11 per person. This is cheaper than the train and almost the same as the coach. So, the best London Stansted Shuttle for you is the 8–Seater. You can even book more cars of this type if your group is bigger. Moreover, with 247 Airport Transfer you can be assured that your journeys will always be pleasant, comfortable, affordable and, what’s more important, on time. To get a quote for a Stansted Shuttle Transfer click here: London Stansted Shuttles.